I live on a mountain 2,230 feet above sea level along the spine of the Green Mountains. To get anywhere we descend about 430 vertical feet and there are ditches along the gravel road that serve to drain water when it rains and preserve the road from washouts. Our driveway is similarly crowned with ditches on the sides. I don’t recall ever seeing water run down them in 35 plus years of driving the CCC Road in either direction. On August 28, a Sunday, we had rain and some wind. We lost power for a while, not even a whole day as I recall. And to be honest, I had no idea that a lady named Irene had done her worst ’til the next beautiful, blue-sky day when we walked down the 1.5 miles to Pierce’s Store in North Shrewsbury. Our driveway had a few washouts – nothing horrendous. But the CCC Road was another story. The water overran the ditches as the culverts clogged with debris so one lane or more of the road was gone and toward the bottom, not even one lane existed. A young neighbor was raking and placing rocks to make two tire paths so we could maybe drive out. Further below, there was severe damage and a stream had taken out a bridge to a home and the adjacent road was gone and their car was nose down in the water. From a large gathering of neighbors, we learned about the extensive damage in town. It was unfathomable. So by now, we are all familiar with the loss of lives and property. Like me, you might still be shocked to have lost someone you knew to water and sometimes wonder if it were all just a bad dream. Or you might be pondering if this was one of those 50- or even 100-year freaks of nature? We’re used to snowstorms and two-or-more-day power outages. And some of us know about the 1927 and 1938 floods and even 1973 and 1976 when rains did damage to places like ski areas and undermined some lifts. But rains that wash out main highways and byways? That isolate 13 towns? Or take the lives of four people? Rain that takes away homes? Or turns living into a nightmare? 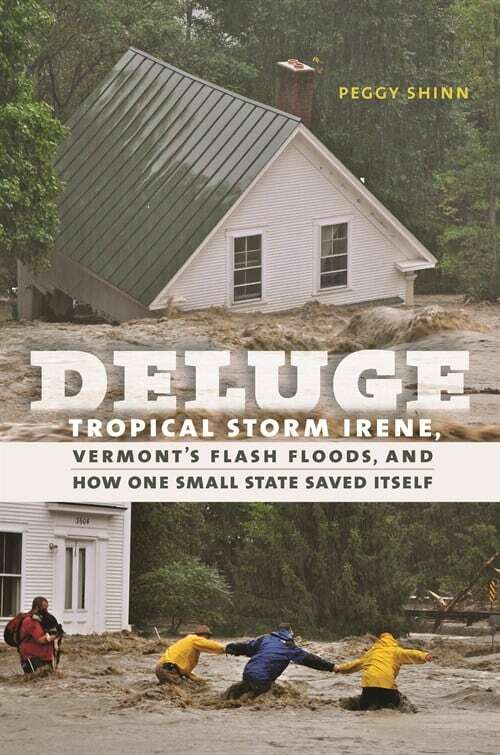 To help you get a sense of how that can happen, I strongly recommend reading the just published Deluge: Tropical Storm Irene, Vermont’s Flash Floods, and How One Small State Saved Itself. Written by Rutlander Peggy Shinn, this is not just “another flood book.” It is a riveting account that reads like a ‘who-dun-it’ even though we supposedly know what happened. And therein lies the strength of this book. It is structured in such a way that you learn facts about water and nature – at times disconcerting and scary – and then the real life stories of people who experienced the full force of nature in a manner that we never knew existed. It is a story that is at once horrifying in its devastation and yet redeeming in its look at the ability of people to carry on and to help others. It shows nature at her worst and the human spirit at its best. I read every word. I knew almost half the people mentioned and even those whom I had never met I came to feel “I knew them.” And there were real heroes, lots of them. That alone made the story resonate, but it was the writing that made me read on. This is a well-written account that contains an amazing amount of research into history as well as into the lives of people and towns affected by Irene. Mountain Times readers will be especially interested in the accounts of how the people in Pittsfield, Killington, and Rutland rose to the occasion. In fact, it was their stories that first struck the author and motivated her to write; this is her first book. Seeking to help her sister cover the Irene story for the Wall Street Journal when its reporter couldn’t get into Vermont at first, Peggy Shinn rode her mountain bike to Pittsfield on the Wednesday after the storm (when her young daughter had returned to school). Although Route 4 was gone in Mendon, she had found out about the Woodchip Highway, from fellow cyclist Tom Horrocks and was able to make her way to Killington and Pittsfield. There, she heard and saw firsthand the real meaning of the flood – human ingenuity and caring that went into rescue and recovery. It was on her ride back down the mountain that she realized that their stories needed to be told, she said. So she spent a year researching Irene and interviewing Vermonters, not just locally but in Wilmington, (which “experienced the steepest financial losses: $13 million”) Jamaica, and South Royalton as well as the aforementioned Rutland, Killington, and Pittsfield areas. She contacted various agencies and she wrote. Chances are you will know some of the people in the book; perhaps you are even in the book! No doubt you will benefit from learning how folks survived the devastation and helped one another in true community fashion. Because Deluge is a collective story told through the eyes of a few – no one book or person could ever gather the thousands of stories from Irene – a website www.vermontflood.com was set up for others to share their Irene stories. One of the many insights I gained as to why a little rain can do so much damage came from Shinn’s explanation of just how rain and water operate. After providing much historical information on Vermont’s history of floods, Shinn writes in Chapter 4, All Hell Breaks Loose: “As Irene churned northward, weather forecasters used the term “flash flood” to warn of possible destruction in New England. But flash flooding is difficult for Easterners to comprehend. It’s most often associated with the arid West, where monsoon rains in the summer can suddenly fill dry washes. And therein I finally understood why the CCC Road on the Plymouth side was gone where water had poured down the mountainsides and why on the Shrewsbury side, where no streams had existed, the water had suddenly torn up the road and moved it downhill and where a brook had babbled, a car lay in a new river. “Waiting for months to hear from FEMA, those who were most affected by Irene were left in limbo and in debt – a homeless purgatory in which they could not see more than a day or two ahead. Nor could they look back. For nothing remained and the nightmare continued. Shinn’s background helps to explain why this is an unusually enlightening book as well as a good read. Shinn was raised in Lyndon Center, Vt. She has a BA in geology from Amherst College and a MS in environmental science and engineering from the Colorado School of Mines. She’s been a freelance writer since 1993 and is an avid skier and cyclist. Her education helps to explain her understanding of topography, such as when she observes: “Short of tunneling through the mountains, or switch-backing up and over them, Vermont roads simply have to follow river valleys. Fluvial erosion caused by flashing flooding is part of the geologic cycle – a mechanism for turning mountains into plains.” When asked, “Based your research and what you learned, do you have an educated guess or gut feeling about whether we will see another Irene or if it is a once in a 50- or 100-year event,” Shinn didn’t hesitate to say, “This will happen again… within the next ten years,” siting climate change as part of her reasoning. She is also hopeful that the many questions raised by the storm, rescue, and recovery work will lead to prevention and mitigation measures, noting that all the questions will “take years to answer – if they are answered at all.” One would hope after reading this book, that readers will take action and that the lives lost and damage done will not have been in vain. Perhaps readers will continue to nudge those still reluctant. “When the next natural disaster strikes, Vermonters will no doubt respond as they did to Irene,” she said, the ultimate compliment to what so many volunteers and fundraisers accomplished. Shinn will be speaking and/or doing book signings at: Bartleby’s Books in Wilmington at 4 p.m. on Saturday, Aug. 24; at Phoenix Books, Burlington, 7 p.m., Aug. 28; Fletcher Cavendish Library, Proctorsville, 7 p.m., Aug. 29; and at Base Camp Outfitters in Killington over Labor Day weekend, Aug. 31 at 4 p.m. Shinn urges readers to purchase locally. You can find Deluge at the Book Nook in Ludlow, at Base Camp Outfitters in Killington, and Yankee Bookshop and Shiretown Books in Woodstock. Also try Book King in Rutland as well as stores in Pittsfield, Wilmington, Jamaica, and Royalton. Deluge was published by University Press of New England and retails for $27.95 hardcover and $22.99 ebook.